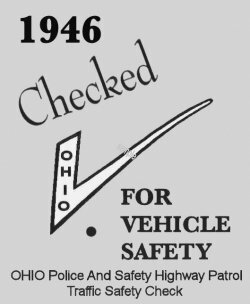 1946 Ohio Safety check sticker - $20.00 : Bob Hoyts Classic Inspection Stickers, Add a Final Touch to your Restoration! Ohio had a form of inspection as far back as 1937. This 1946 sticker was issued when a roadside inspection turned up bad equipment and is still done today. When the owner repaired the flaw the garage placed this sticker on the car. The sticker is also issued by car dealers to show the car you were buying was safe.